40 is the new 20. . .
. . .proclaims the fashion magazine on the moderne glass coffee table at the eyebrow artist's salon. "grace kelly-look-a-like leaves harrison-ford-double for jabba-the-hut's doppelganger!" screams a tabloid on the subway. basics of brewing coffee, all the while wishing i actually had the full-blown handbook. what's caught my eye today specifically is table 7, which shows how the brewing water's temperature affects coffee sweetness. that's right: coffee, like most fruits, naturally contains yummy sugars. it also contains some bitter compounds, like caffeine and chlorogenic acid. what's fascinating is that the correct water temperature when brewing coffee will bring out more of coffee's natural sugar sweetness and less of the bitter agents! for those of us who make a lot of coffee in the cafetiére (a.k.a. french press), this is vital information. with the same grind and 5-min. steep time, 200 degree f. (94 degree c) water will "wash out" up to 50% more natural sugars than brewing with too cold water (in the table, the too cold sample was 160 degrees f., about 70 degrees c.)! bccy regulars know i usually brew with 198 degree f. water. but i'm going to try to pre-heat my bodum a little longer to bump the temperature up that extra bit. let me note that dark-roast beans, say, french or italian, might be a little better off with water at 195 degrees f. (about 91 degrees c.), due to the chemical changes in the coffee caused by the longer roast time. 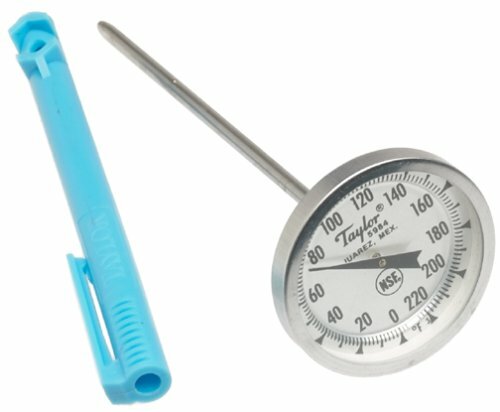 you french-press coffee lovers might feel a tad odd wielding your instant-read kitchen thermometer while making coffee, but! but! we have the scientific information to prove that it's worth it and does make a difference. . . your coffee will taste better! it's ultra-warm today, so i brewed up the remainder of k.'s famous sidamo and froze it into java ice cubes. i'll be having iced coffee with sidamo cubes all june! that left me with a just a touch of oren's tremendous coffee. why waste it? i made it into an americano, which i sipped while nibbling a bit of dagoba's new moon 74% chocolate bar. look, i could be doing far worse! next week i'll be going back to don schoenholt's gillies storied yrg. . .no need to pity me at all.